The Hilton Colon Quito is conveniently situated just 20 minutes away from Mariscal Sucre International Airport and a ten-minute walk from the colonial Old Town of Quito, a UNESCO World Heritage Site. In addition to spectacular views of the city, guests can choose from five dining experiences, including gourmet Mediterranean at Portofino and Japanese cuisine at Kioto. For night time entertainment the hotel has a late-night casino. Choose a Suite for mountain views or an Executive Room for Executive Lounge access. The hotel has a heated outdoor swimming pool, adjacent to the gym with weight machines, sauna, steam bath and massage service. All Hilton Colon Quito hotel rooms have wireless internet access. Standard Room Amenities feature: King-size or twin beds, cable TV, soundproof windows, air-conditioning, clock radio, electronic locks, smoke detector, hair dryer, minibar, telephone with dataport and work desk with lamp. Suites offer the aforementioned plus personalised service, Jacuzzi, kitchenette, king-size beds, private check-in/out, breakfast snacks, soft drinks and happy hour included, coffeemaker, iron and ironing board, bathrobe, second telephone in bathroom, welcome amenity, a mini-business center, meeting room access, and more. ADA and non-smoking rooms are also available. Additional hotel amenities: Multi-lingual staff, laundry/valet service, airline desk, baggage storage, barber shop, beauty salon, car rental desk, clothing store, concierge desk, elevators, florist, foreign currency exchange, gift shop, guest activity/recreation desk, local area transportation, lounge, luggage hold, news stand, safety deposit box, tour desk, and room service. The business center provides audio/visual equipment rental, business phone service, cellular phone rental, express mail, fax, meeting rooms, photo copying service, printer, secretarial service, and typewriter. There are also services for children: Fitness room, pool, sight-seeing tours, babysitting service, children's menu, cribs and high chairs. 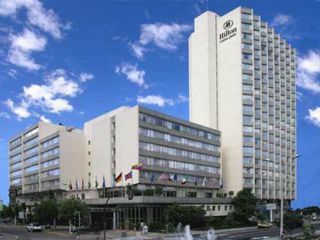 The Hilton Colon Quito provides all the necessities experienced travelers need and expect from a world-class hotel.